Oh no! That's what she forgot! This sounds intriguing and interesting. Will definitely look forward to the next installment. Thank you, I hope it continues to pique your interest. This is pretty good. I'll be back to read some more. But, she had it in the car....girl friends sweater? Good so far, will look forward to the next installment. Yes, she did have it in the car. Thanks for your interest. It is encouraging! Sorry - I meant to put "what is its significance?" not "it's" - where that apostrophe came from I do not know!! She had the sweater in the car! Where is Sam? I like your story, Lynda. It caught me up immediately. I wanted to know where Sam was? Was he dead? Or had he left her for another woman. The innkeeper giving his wife a warning look increased my curiosity. Great job. 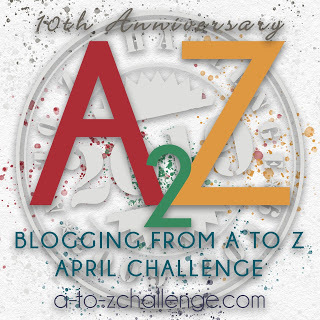 I am a writer that loves writing fiction and non-fiction and I participated in the A to Z Blog Challenge and continued the story I have been writing there since the 2013 Blog Challenge. I visited many blogs but yours was not one of them but I have you on my list now. I'm so glad I discovered you in the comments you made on the Part 1 on Lee's blog about the challenge. Intriguing start. I immediately thought Sam must be dead, but maybe not. I'll have to come back and see what happens next. That was an interesting read, wonder how it ends! You got me. Looking forward to part 2. Welcome to the wonderful world of fiction writing - something I have attempted in a yearly happening called NaNo WriMo - then I bury the manuscript, never to be seen again. Takes courage to publish online. Hope you get some good (and positive) feedback. I have thought about NaNo WriMo. I can’t imagine myself committing to it though. Maybe one day.